Tree on the far left was killed by pine wilt. The others quickly became infested. 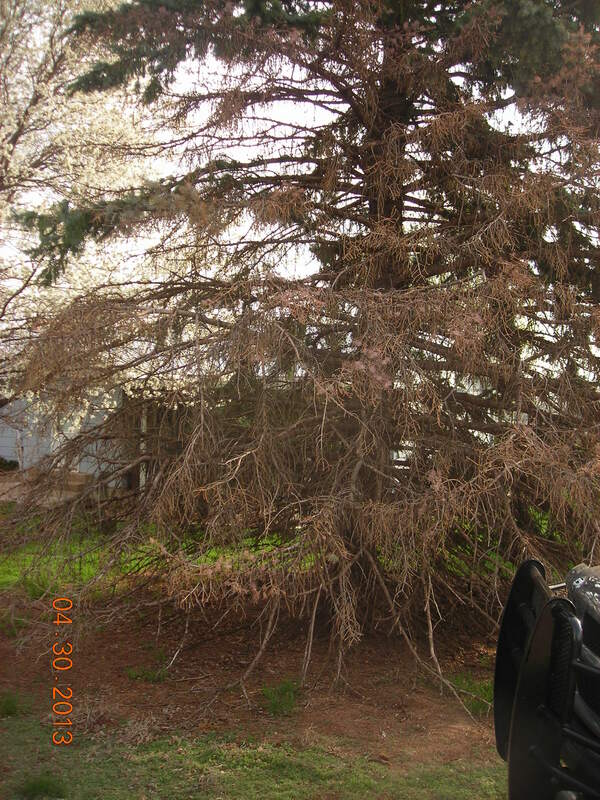 Categories: Uncategorized | Tags: dying pine trees, pine problems, pine wilt | Permalink. Cooler nights and falling leaves signal that fall is here. Pines in the area are starting to change colors too. Knowing the cause of the discolored needles will help to know if it is nature taking its course or if it is a disease infecting your trees. 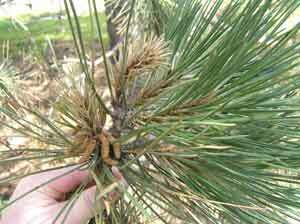 Across the area, yellow inner needles in pine and spruce have just started to appear. Evergreen needles change color in the fall too, just like deciduous trees. It is a normal occurrence called natural needle drop. The older interior needles of pine and spruce are turning yellow and drop from the tree. The older needles that are lost are usually located closer to the inside of the tree or trunk. Factors that increase the stress on an evergreen can intensify the autumn needle drop. These stress factors can include drought, herbicide injury, root damage, or insect or disease damage. Like many living things, evergreen needles also have a lifespan. Pine trees hold their needles for 2-3 or more years. Spruce trees hold their needles longer than pines, usually around 5-7 years. After the needles have lived their lifespan, they fall from the tree. Some trees, like the white pine, make it easy to see the needle drop. 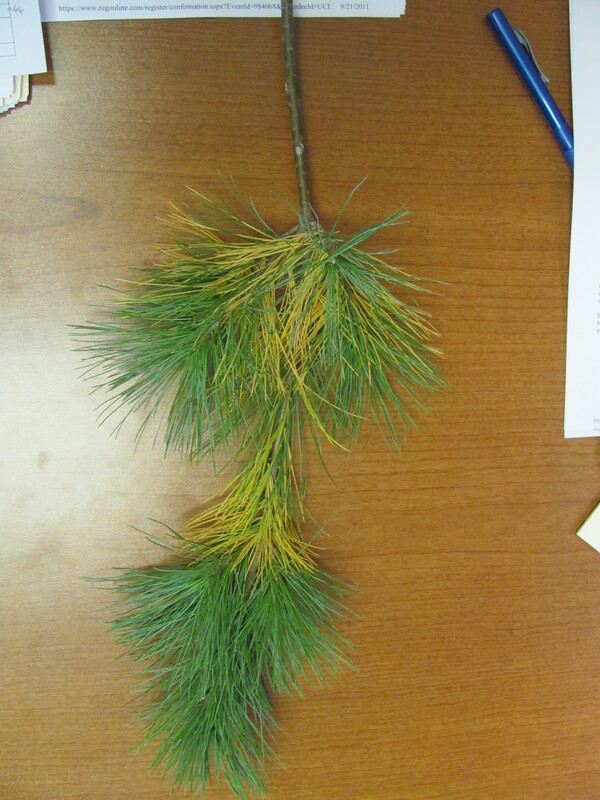 The location of the discolored needles can determine if it is natural needle drop or if something else has infected the tree. If the tip of the branch was the only part affected this spring, fungus could be to blame. Cool, wet springs are ideal conditions for fungus, this spring was no exception. The Sphaeropsis tip blight fungus will infect the new growth as it emerges causing it to turn brown and hang on. If fungicides are applied, the best time to spray preventative treatments for Sphaeropsis tip blight fungus is April. 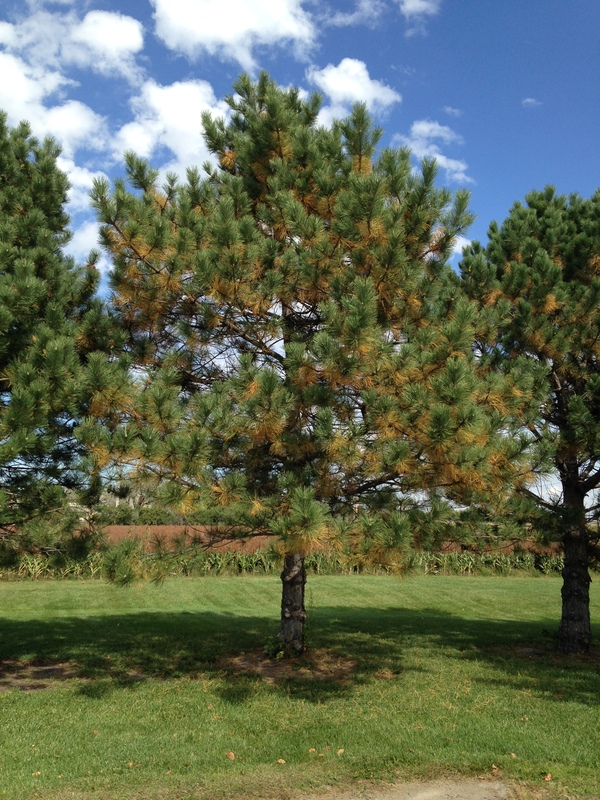 One of the most common pine diseases is also caused by a fungus and can also cause brown needles. Dothistroma needle blight causes reddish lesions found on individual needles. It causes the needle to appear to be half green and half brown on last years’ growth and mainly affects the lower half of the tree. Preventative fungicide applications can be made in mid-May and again in mid to late-June. One way to prevent needles from changing color next spring is through irrigating now. Moisture helps to promote root growth and reduces winter desiccation injury. Supplemental fall irrigation should be continued, when there isn’t precipitation, until close to soil freeze. When air temperatures in winter are above 40 degrees Fahrenheit apply water early enough in the day so it can soak into the ground before temperatures drop below freezing. This will help to avoid the water from freezing on the surface at night when the temperatures drop down. Apply enough water to moisten the soil eight inches deep under the drip line of the tree. Be sure to check the soil moisture before irrigating to avoid irrigating a saturated soil. Proper identification of the culprit behind the color changing needles can help you determine if this is nature taking its course or if you have some action to take in the future. Categories: Trees | Tags: evergreen needles, Natural needle drop, pine, pine wilt, sphaeropsis tip blight, UNLExtension, Yellow needles, yellow pine needles | Permalink. The most common horticulture question this season has been “What’s wrong with my evergreen tree?” While this may sound like an easy question to answer, the solution really depends on the symptoms, the trees affected, and the plants’ history. Many trees have been showing symptoms this year that are actually the result of last year. A few of the most common trees that have been showing symptoms are arborvitae, cedar, and spruce. While we think of these trees as being tough-as-nails, every plant has its threshold. These trees are tough until the going gets rough and the moisture gets short. Browning foliage or completely missing needles have plagued these species. The most common cause of these symptoms we have been seeing in these trees is due to the drought and lack of moisture. Trees that didn’t receive supplemental water during the drought last summer or throughout the winter are just now showing symptoms. Deciduous trees were also affected by last years’ drought. Symptoms can include slow bud break, stunted growth, or even plant death. 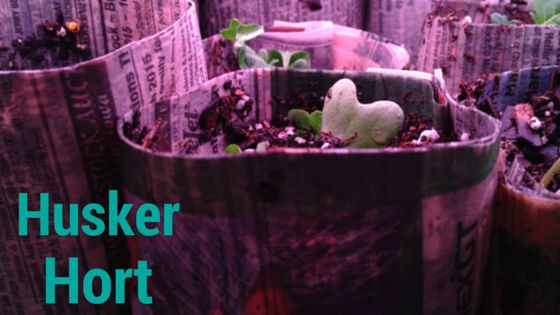 How severely the plant was affected can make a difference in how you tackle the recovery. If you have trees that are completely brown or have no needles or leaves, the sad news is that they probably won’t recover and replacement might be your best option. If you have trees that have brown spots or branches in the canopy or are just slow to leaf out, there could still be hope. Make sure that trees have at least an inch of supplemental water a week in the absence of precipitation or irrigation. Do not fertilize stressed trees. It could cause more harm than good. Pine problems are also plaguing many homeowners. Where the brown is occurring in the tree can make a difference in what is affecting them and how to treat it. Trees with brown tips on this years’ new growth, could be caused by a fungus. Last years’ new growth that is half brown and half green could have also been caused by a fungus. Sphaeropsis tip blight and dothistroma needle blight are common in older, well-established trees. The fungi that cause these diseases overwinter in dropped needles or pinecones. The best time to spray for either of these fungal infections is earlier in the season around April or May, depending on the fungus. Right now if you are noticing brown tips, they can be pruned out, but it is too late for fungicide applications for this year. The trees with needle blight often are still able to photosynthesize with the remaining needles, so curative treatments are rarely recommended. 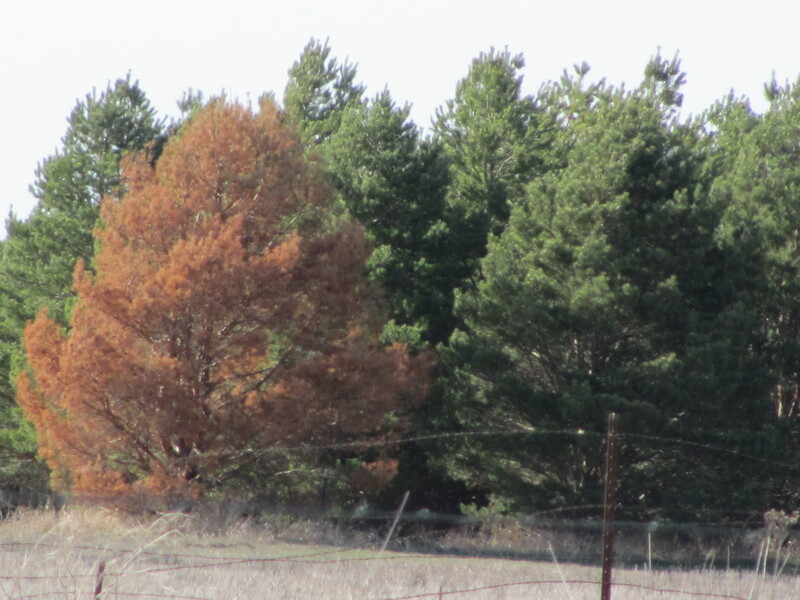 Another pine problem in our area is pine wilt. The symptoms start as the entire tree or a major branch turns an off grayish green color. As the nematodes progress and multiply the tree turns tan and then eventually brown. The dead brown needles will remain on the tree for a year or more. The wood from the tree will also be very light in weight and have almost no sap or sticky resin in the wood. 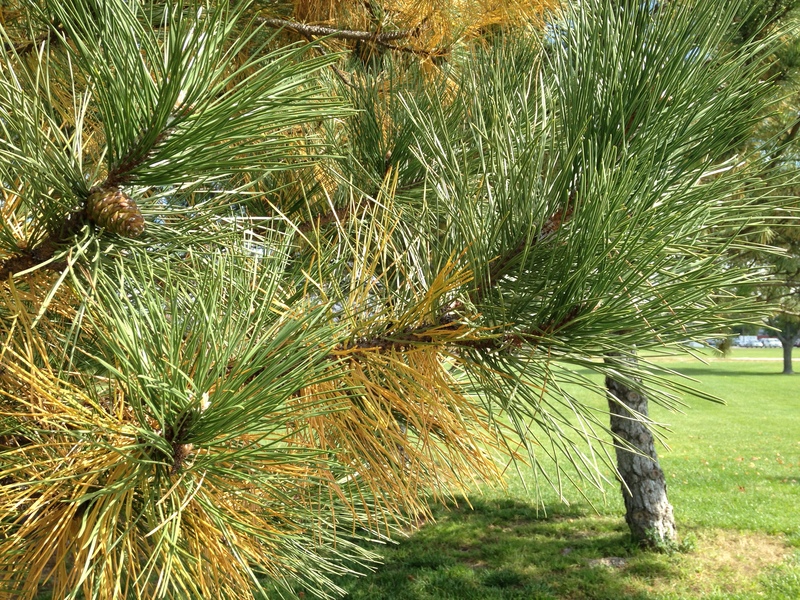 Prevention is the best method when it comes to pine wilt. Insecticidal treatments could help to protect high value, susceptible trees. Trees need to get the treatment before they show symptoms of being infested with the nematodes. The cost of the treatment depends on the size of the tree, an average cost is around $200-$300 per tree (approx. 10 inch in diameter). The products must be injected into the tree at least every 2- 3 years. The treatments are between 70-90% effective in preventing pine wilt. Once a tree develops pine wilt, there isn’t a curative treatment. The diseased tree needs to be destroyed to prevent the pine sawyer beetle from leaving the infected tree and spreading the nematodes to nearby healthy trees. If a tree dies May 1 through October 1, it needs to be removed and destroyed immediately. The trees need to be burned, buried, or chipped as soon as possible to prevent the beetles from emerging out of the wood. The wood should not be saved for firewood, but the wood chips can be used as mulch. Proper identification of the issue is key to knowing the outlook of the situation and the possible treatments. Can’t get enough horticulture information? Listen on Fridays at 8:15 a.m. on KRGI 1430 am to hear ‘Everything Outdoors.’ It is a live call-in radio show in which Hall County Extension Educator Elizabeth Killinger gets you the answers to your horticulture questions. Categories: Trees | Tags: arborvitea, diplodia needle blight, pine, pine wilt, sphaeropsis tip blight, spruce, UNL Extension | Permalink.